(File) Nigerian returnees arriving at the Port Harcourt International Airport in Rivers State on February 13, 2018. A fresh batch of 155 Nigerians stranded in Libya in their attempt to crossover to Europe for greener pastures has returned to the country. 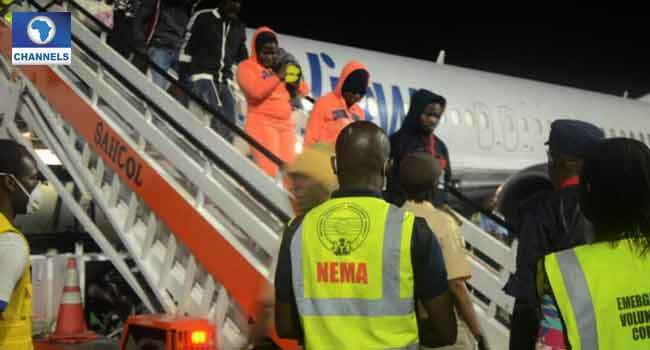 The returnees were received by officials of the National Emergency Management Agency (NEMA) on Friday at the Cargo Wing of the Murtala Muhammad International Airport in Ikeja, Lagos State. They decided to return to Nigeria voluntarily after the International Organisation for Migrations (IOM) offered them free transportation back to the country. Mr Segun Afolayan, who welcomed the returnees on behalf of NEMA Director General, Mustapha Maihajja, urged them to utilise the new opportunities to restart a new life in their fatherland. “We have been inundated with a tale of woes on the sufferings that many of our nationals are going through and efforts are being made to ensure that helps get to all,” he said. “Presently, we have very responsive and responsible government that cares for the well-being of all Nigerians and it will not let Nigerians down, but we want you to be agents of positivity by supporting this Federal Government in its efforts at rebuilding the country progressively,” Afolayan added. After profiling by the emergency agency, the returnees comprised of 41 female adults, including five pregnant women; one female child and a female infant, as well as 107 male adults, three male children and two male infants. One of the returnees who simply identified herself as Khadija Balogun from Ogun State said she regretted the attempt to embark on such a perilous journey. She revealed that her ordeal started from Cote D’Ivoire, through to Mali and arriving at Libya, after which she landed in the hands of kidnappers. The 23-year-old lamented that she spent a total of N1.1 million to get to Libya. She said, “In the hands of kidnappers, I was sold out and had to free myself with N400,000 and another group arrested me and kept me in jail for a year before my parents raised N750,000 for me before I finally got out. “Imagine that I use N1million out of the money wasted to start a business, I would have been very prosperous. No one should try to travel to Libya; if you try it, it’s seven years imprisonment waiting for you on arrival,” Khadija added.